At Freya Lillie we have an Organic Cotton range, featuring all in ones and bloomers in plum and cream/black stripe. Organic cotton is certainly a fabric which is taking off, with many large-scale fashion players starting to adopt this fabric due to its fabric properties and array of benefits to the environment and our health. It’s true that organic cotton is a little more pricey than regular cotton however the additional benefits of choosing organic are evident. Organic cotton plants are free from pesticides and fertilisers meaning strong chemicals don’t come into contact with the plants and the soil. Farming organic cotton improves the fertility of the soil, helping to lock CO2 into the soil therefore reducing the effects of climate change. 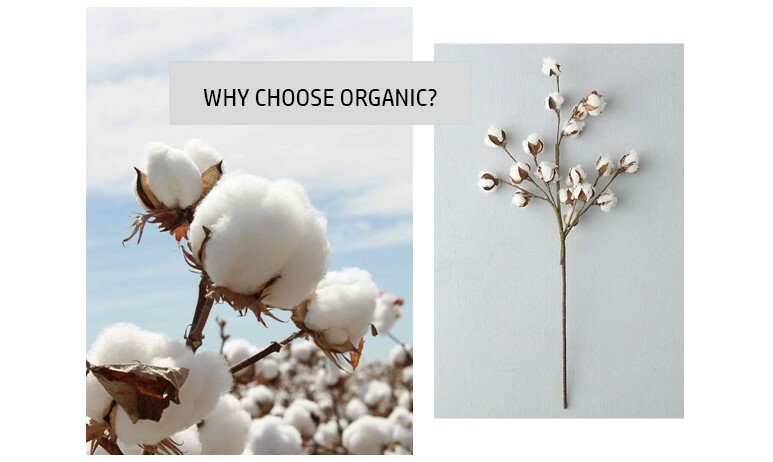 Organic cotton in comparison to standard cotton is a better quality, more durable fibre. Conventional cotton clothing starts to wear after 15 washes whilst organic cotton can last 100+ washes. Organic cotton is hypoallergenic, meaning that it is gentle on the skin and effective in causing no irritation to skin conditions such as eczema. Since the farming of organic cotton doesn’t use toxic pesticides this prevents health conditions and deaths of farmers which are linked to being in contact with these chemicals in non-organic cotton production. Unlike regular cotton, organic cotton is not produced using Genetically Modified Seeds. Cotton is a natural fibre which therefore doesn’t contribute to the increase in microfibers polluting our oceans. This organic cotton range is made with a thick luxurious sweatshirt material and is fully fleece lined. These pieces are gender neutral therefore once your child grows out of the garment, they can be passed down to siblings and friends of any gender. The cream and black striped fabric comes in an all in one and bloomers- stripes are very classic and timeless, therefore these pieces will never go out of style. This rich plum shade also comes in an all in one and bloomers- this colour can be worn all year round but would look especially lovely next season in Autumn since this plum shade works well paired with leggings or woolly tights and a pair of boots. Aren’t these bloomers adorable? – A great piece for your child to lounge around the house in. Pair with a t-shirt or jumper depending on the time of year.